The following articles have been published on the subject of Nellie Sheridan Wilson in order to promote fundraising events and historical lectures on the subject of Mrs. Wilson. Nellie Sheridan Wilson will be immortalized by the erecting of statue in the square at Somerset for the Perry County Bicentennial in 2017. 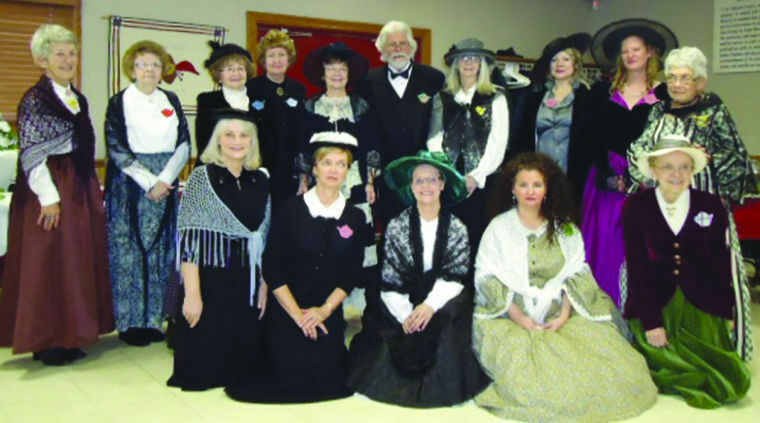 Each year that passes for the Perry County Historical and Cultural Arts Society, brings with it the promise of finding a new Perry County historical treasure. Perhaps, a once cherished coverlet or a delicate piece of heirloom clothing, neatly folded within an old trunk ,or an all but forgotten drawer, last lovingly touched by hands now gone, tucked away among mysterious contents, smelling of old musty and lavender, a virtual hodge podge of venerable delights, quietly awaiting discovery. Quite possibly, one may discover a cache of vintage photographs of a bygone era, depicting an unusual situation or provoking an unheard story. Things in Perry County, both tangible and intangible, have a way of resurfacing and beckoning the present generation to its unique history. The deep-rooted and sacred traditions of the past, not only humanize history, but also sustain our cultural past. Proudly, we report that not only have we acquired material items of yesteryear, but that we have witnessed dreams of those who have gone before, come to fruition. In the late 1930’s, it was a dream of Mayor Tom Johnson’s grandfather, and others, to make available the historical Glenford stone fortification site. By collaborating with the Perry County Soil and Water District, Heartland Earthworks, Highland Nature Sanctuary, and the Arc of Appalachia Preserve System, we have achieved the dream of making the three hundred and ten million year old rock formation accessible. The Perry County Historical Society will offer educational programing from the ancient Hopewell site and it will be the only one of the one hundred burial mounds within Perry County available to the public. Fittingly, the PCHCAS plans to celebrate its 50th anniversary at the Glenford Fort. If you are an American Civil War buff, you will be pleased to note that the Civil War lecture series continues. Once again, murmurings of gallantly courageous and sometimes woeful tales of the American Civil War reverberate within a neighborhood boasting some of Perry County’s finest examples of historical architecture. The area, of course, is the nationally recognized Main St of Somerset, Ohio. The buildings, appearing on the National Register of Historical places, not only exhibit some of the best examples of Federal and Italianate style in the area, but were once the stomping grounds of famed Civil War General, Philip H. Sheridan. In fact, history reports that he often played marbles but a stone’s throw away from the lectures, at the site of his monument. His statue, Ohio’s first Civil War equestrian statue was erected in 1905. Over 1,243 Perry County men fought in the American Civil War. The lecture series, named for Perry County’s favorite son, brings American Civil War history to life for a new generation of area residents. The lectures, which are held at the Perry County District Library, Somerset Annex, commence on the last Saturday of each month and begin promptly at 6:30 p.m. Although donations are happily accepted, all lectures are offered free of charge for anyone who wishes to attend. The Perry County Historical and Cultural Arts Society have had the privilege of engaging numerous speakers from the Ohio Humanities Council to present on various Civil War topics. Quite often, lecturers appear in period attire. We encourage all to come and take part in the roundtable and to meander about the quaint streets of Somerset. Perhaps, Perry County’s greatest treasure is her people. This year, the Perry County Historical and Cultural Arts Society, in conjunction with the Perry County District Library, and The Perry County Chapter of the Ohio Genealogical Society will conduct an oral history project. Soon, Perry County residents can check out a digital tape recorder from the library and record their history. Participants will answer questions from an included questionnaire. This worthwhile project strives to include all history and no story is too small or insignificant. Some of the most interesting stories and people do not appear within the pages of history books. We believe all stories truly matter and contribute to our proud Appalachian heritage. All are beautiful and magical in their humble simplicity. If we do not take an active initiative in the preservation of our history and culture, nobody will. It could forever be lost. As stewards of our own place and age, we have a special responsibility to provide future generations with a sense of cultural identity. Giving the gift of heritage is perhaps the greatest legacy that we can leave. Imagine the thrill of your great-great-great grandchild hearing the story of your life as told by you. Please take part in this special project. 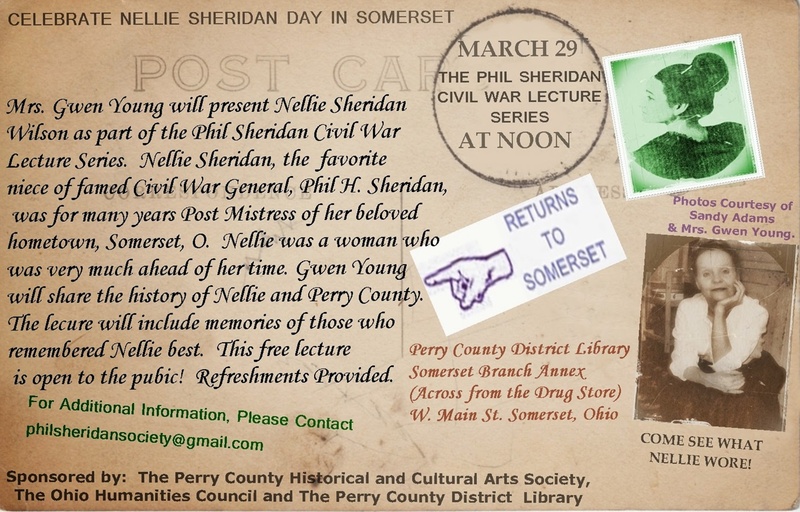 Furthermore, the life of Phil Sheridan’s favorite niece, beloved Somerset Postmistress, suffragist, and quirky Perry County character extraordinaire, Nellie Sheridan Wilson, will be immortalized by erecting a statue in the square at Somerset for the Perry County Bicentennial in 2017. The statue, sculpted by local artist, Alan Cottrill, is to stand directly in front of Nellie’s nineteenth century post office and serve as an interpretive piece of history. Gwen Young and Sandy Adams are spearheading this endeavor. If possible, please donate to this worthy cause. The statue will cost $50,000. Previously, the society hosted a Nellie Sheridan Tea to create community awareness of the proposed statue. Additional events will take place within the next two years in order to generate support. Nellie, like her “Uncle Phil,” is still very much a relevant figure. If you would like to learn a bit more about Nellie Sheridan, please visit her website at nelliesheridanstatue.wordpress.com for additional information on how you can become involved. In the coming year, the historical society will continue to work on the historical Babb House in Somerset. The Babb House, aptly named for Perry County pioneer, Jonathon Babb, is the future site of the new Perry County Museum. It is the aim of the society to offer classes, provide lectures, and access to local displays and local archival materials, within its historic hand hewn brick walls. The building, although located within Somerset and on the National Register of Historic Places, will encompass the history of Appalachian Perry County as a whole. In October, the PCHCAS will again present Oktoberfest! Oktoberfest is a celebration of German heritage that highlights local food, local arts and crafts, historical demonstrations, local musicians, and Appalachian folklore. 2015 is an exciting year in Perry County. We invite everyone to not only walk in the footsteps of our pioneer ancestors and listen to their stories, but to partake in the making of history by aiding in the Nellie Sheridan Statue Committee or participating in the upcoming oral history project. Remember to check out our website at www.hcapc.org or follow us on facebook at https://www.facebook.com/perrycountyhsitory For additional information, please contact PCHCAS President, John McGaughey, at 740-987-4862 or via e-mail atjjmcgaughey@gmail.com. The first ever official Nellie Sheridan Day was celebrated in Somerset. The event included a lecture by Gwen Young and Sandy Adams on the subject of Nellie. It also included the pealing of the Old Somerset Courthouse bell in her honor. Sandy Adams as Nellie Sheridan Wilson Photo taken at the Young Farm. On Saturday, the Perry County Historical Society will recognize the life of Nellie Sheridan-Wilson, niece of Civil War General Phil Sheridan. The event will begin at noon at the Perry County District Somerset Annex library, and is free of charge. Posted: Tuesday, March 25, 2014 10:18 am | Updated: 1:49 pm, Tue Mar 25, 2014. The Perry County Historical Society is extending an invitation to the public to celebrate the life of one of Somerset’s most remarkable citizens, Nellie Sheridan-Wilson. Not only was Nellie the illustrious Civil War General Phil Sheridan’s favorite niece, but she also had a fascinating life in her own right. Join former Somerset Mayor and founding member of the Perry County Historical Society, Gwen Young, as she retells the life of Nellie Sheridan-Wilson. There will be several artifacts from Nellie’s life, including a dress that will be worn by Sandy Adams as she helps Gwen portray Somerset’s favorite Postmistress. There will also be many never before published photographs of Nellie as well as many Sheridan family artifacts that have never been exhibited prior to this presentation. 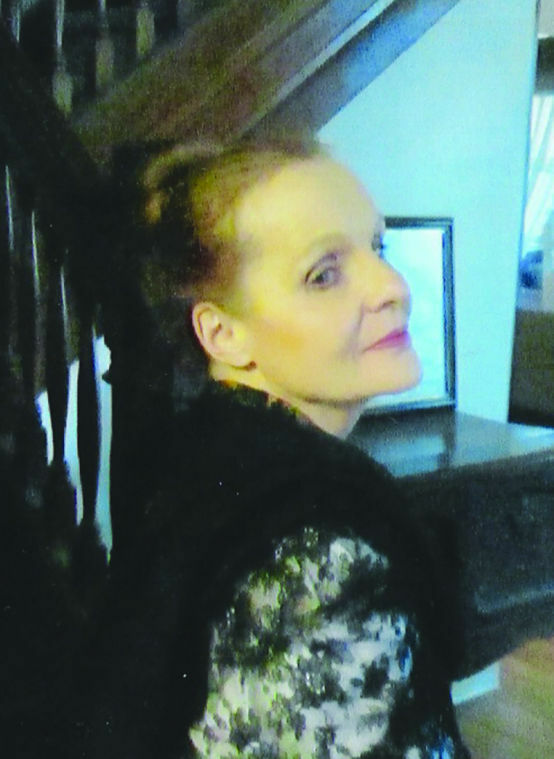 There will also be a publication for sale detailing the life of Nellie Sheridan-Wilson that has been compiled by Gwen. The proceeds of the publication will go to the Phil Sheridan Society Lecture Series to help off set the costs of future lectures and events for the public. This free, family-oriented event is being presented as one of the many lectures of the Phil Sheridan Society Lecture Series. The presentation will be at noon on Saturday, March 29, at the Perry County Library Somerset Annex. Tom Johnson, the current Mayor of Somerset, will issue a proclamation declaring March 29, Nellie Sheridan-Wilson Day. To celebrate the proclamation there will be a ringing of the bell at the historic 1829 courthouse located in the heart of downtown Somerset. Refreshments will be provided at the library annex prior to this fun-filled lecture. Guests are welcome to come early as this promises to be a popular and entertaining event celebrating the life of one of Somerset’s remarkable citizens! Any questions regarding the event contact the Phil Sheridan Society at philsheridansociety@gmail.com. Gwen Young spoke to the Somerset council about the addition of a Nellie Sheridan in 2017. Posted: Monday, November 10, 2014 3:22 pm | Updated: 8:50 am, Wed Nov 12, 2014. SOMERSET- Somerset resident Gwen Yong approached council about the addition of a Nellie Sheridan statue on the square during the Nov. 4 Somerset council meeting. A committee has been formed to try to raise funds for the statue. They currently have raised over $1,000 but will need to acquire $40,000 in order to have the statue completed. The committee plans to have the statue completed in 2017 in time for the 200-year anniversary of Somerset. “We want everyone to be as excited about Somerset as we are. This is something that we can all be proud of,” Young said about the statue, “It is a charming square and we want to capitalize on what we already have.” She would like it to be placed in the corner of the square between Underwood’s and the library where it will be with the original post office. The statue will be life sized and will picture Nellie Sheridan as she was around the age of 19 when she was originally appointed by President Harrison to be the post mistress of Somerset. Council passed the motion to allow the statue. Nellie Sheridan Saturday, Jan. 17, the Perry County Historical and Cultural Arts Society will host a special historical themed tea to kick off the Nellie Sheridan statue fundraising drive. All proceeds of the event will benefit the creating of a life-sized statue of Nellie Sheridan-Wilson. Posted: Monday, January 5, 2015 2:49 pm | Updated: 8:18 pm, Wed Jan 7, 2015. Are you proud to be from historical Perry County, Ohio? If you are interested in preserving its amazingly unique and wonderful history for future generations to experience, here is your chance to make a difference.Experience life in the golden age of Somerset as noted local historian and author, Gwen Young, through creative narrative, brings to life the enchanting and sometimes quirky character of Nellie Sheridan-Wilson, the self-proclaimed favorite niece of (General) Phillip Sheridan and illustrious postmistress of Somerset. “Take tea” and listen to tales of yesteryear as Young and daughter Sandy Adams, accurately depict turn of the century life in Perry County through personal stories, never seen before Sheridan family photographs, and personal artifacts.Local historian and archivist, Rob Dishon, will also present an authentic postal display with items from the former McCuneville Post Office. In addition, local artists, Rick Akers and Mary Jane Bugh, will also exhibit their Perry County themed work.On Saturday, Jan. 17, the Perry County Historical and Cultural Arts Society will host a special historical themed tea to kick off the Nellie Sheridan statue fundraising drive. All proceeds of the event will benefit the creating of a life-sized statue of Nellie Sheridan-Wilson.The monument, sculpted by nationally recognized local sculptor, Alan Cottrill, will grace the square in Somerset, juxtaposed in front of her once thriving post office. The Perry County Historical Society hopes to erect the statue by 2017 in honor of the Perry County bicentennial.The tea will commence at the Somerset American Legion from 2 until 4 p.m. Period attire is encouraged, but not required. It will be a friendly affair and open to all who not only have an interest in history, but also would like to make local history. The cost of this event is $10. Please send a check or money order to The Perry County Historical and Cultural Arts Society P.O. Box 746 Somerset, Ohio 83743. For additional information, please contact Young atska10@yahoo.com. Last Saturday afternoon several area residents took part in the official kick off for the fundraising of the Nellie Sheridan Wilson statue to be placed in Somerset. Gwen Young, who is serving as chair person for the project, presented the history of Sheridan Wilson. This will be the first of many events to come within the next year. Posted: Monday, January 19, 2015 3:00 pm | Updated: 6:39 pm, Wed Jan 21, 2015. The Nellie Sheridan Wilson Tea held this past Saturday at the Somerset American Legion officially kicked off the fundraising endeavors by the Perry County Historical and Cultural Arts Society to erect a statue in honor of Sheridan Wilson. The statue will be created by renowned sculptor, Alan Cottrill. 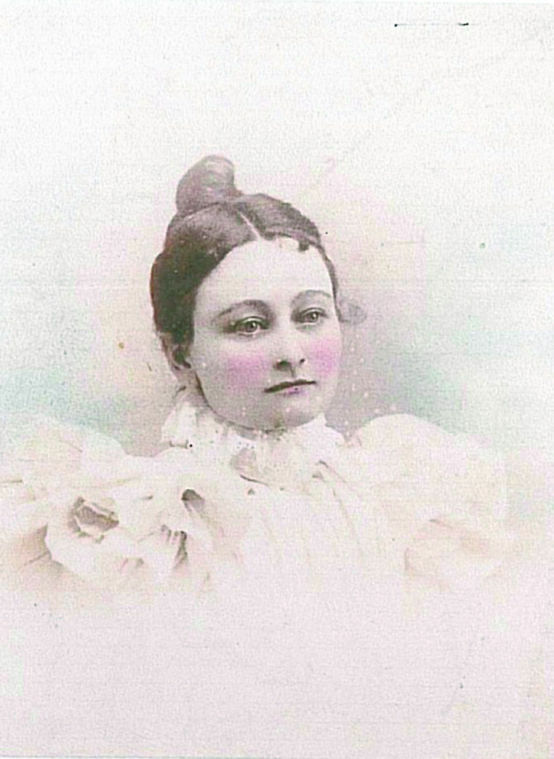 According to committee members Cottrell’s Studio on Sixth Street in Zanesville has been commissioned to sculpt the bronze statue, as she appeared at the age of 19. Cottrill also created the Coal Miners statue that stands in the park on Main Street in Shawnee. While at the tea, attendees enjoyed a wide array of delicious hors-d’oevres prepared by Wendy Riffle and Sue Noll of the American Legion. Cookies, tea, and confections provided by members of the Perry County Historical and Cultural Arts Society, also tempted palates, and added much to the ambiance of the event. Gwen Young, Chair of the Nellie Sheridan Statue Committee, presented a brief lecture on the life of Nellie Sheridan and the significance of erecting a statue of the famous Sheridan as Sandy Adams donned original period attire owned and worn by Nellie Sheridan. Jane Smith, milliner extraordinaire, kindly provided guests with a myriad of elegant, vintage styled hats to wear at the event. Robert Dishon and Jose Lopez, of Shawnee, contributed greatly to the event by exhibiting Perry County postal items that came from the old McCuneville Post Office. Dishon’s grandfather, Frank A. Dishon, the village postmaster, was a contemporary of Sheridan. Jeff Taylor provided his Perry County postal route map. Special guests included Jim Young, Somerset native, WWII Veteran, and former Mayor of Somerset; Fred Taylor, Perry County native and distinguished WWII Veteran, and Dot Bennett, Sheridan family relative. The next meeting of the Nellie Sheridan Committee will commence this evening (Jan. 21), at 5:30 p.m. in the Somerset Annex of the Perry County District Library. Posted: Monday, December 15, 2014 1:44 pm | Updated: 8:08 pm, Wed Dec 17, 2014. Have you ever wondered what it would have been like to have been invited to “take tea” with the Sheridan family, whom at one time resided in Somerset)? Or what it was like to have been a patron in those seemingly ancient days of yesteryear, chatting away the quiet hush of a winter morning with Nellie Sheridan Wilson, the once famous postmistress of Somerset and favorite niece of Philip Henry Sheridan, within the walls of her nineteenth century post office? The Perry County Historical and Cultural Arts Society cordially invite you to travel back into the past, to a time when the women were encouraged to be dainty and amiable, General Sheridan’s memory was still fresh within the psyche of those who knew him, and the conversations were always interesting! Come and see what Nellie’s office was like, learn about her determined and sometimes quirky personality, her ardent political views (gasp! ), view never before published photos, listen to new stories, view local artifacts, learn about her theatrics in the Somerset Opera House, and experience life in turn of the Century Perry County. On Saturday, Jan. 17 2015, the Perry County Historical Society will host a high tea at the American Legion, located on Gay St., in Somerset. The event will commence at 2 p.m. and last until 4 p.m. Period attire is encouraged, but not required. Gwen Young, Nellie Sheridan author and local historian, will present on the subject of Nellie Sheridan Wilson. In addition, there will be door prizes. The cost of this event will be $10 per person and proceeds will benefit the Nellie Sheridan Wilson statue fund. For the sake of convenience, the society will offer a pre-sale of tickets for this historic event. Persons can secure a ticket by sending a check or money order to The Perry County Historical Society, P.O. Box 746 Somerset, Ohio 43783. The reserved ticket will be available at the door at the time of the event. Also, those who are unsure of what activities to engage in over the holiday weekend, please attend the Phil Sheridan Civil War lecture series, Saturday, Dec. 27 at the Perry County District Library, Somerset Annex. This month, Young will present on the topic of Nellie Sheridan Wilson in a special encore of her Nellie Sheridan Day presentation. The event will begin at 6:30 p.m. and is offered free of charge to the public. Refreshments provided. 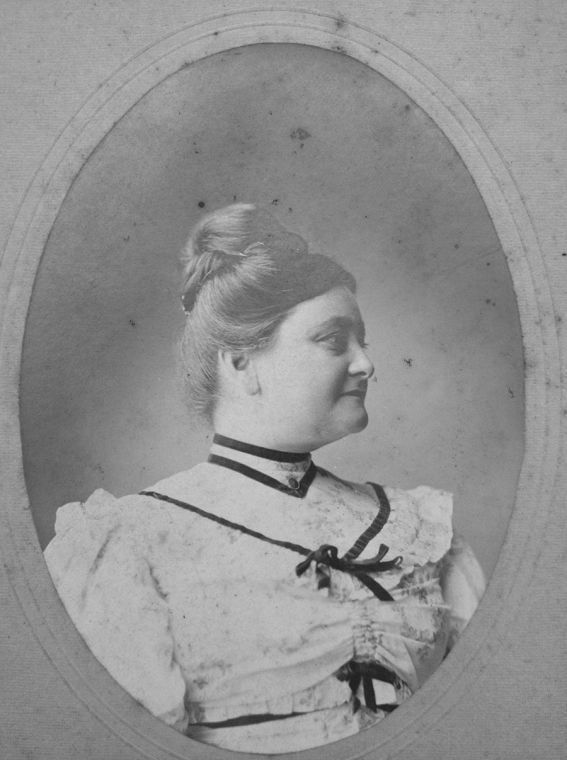 President Benjamin Harrison appointed Nellie Francis Sheridan postmaster of Somerset when she was 19 years old– or 18, depending upon the newspaper you were reading in 1897 if the President was introduced to Nellie, he saw a vivacious, intelligent young woman who had been working with the Democratic Party for several years, even though she could not vote. She was interested in promoting any endeavor that concerned children, women, the Holy Trinity Church, or a statue of her famous uncle. Gen, “Little Phil” Sheridan. The accompanying photograph of Nellie shows her at age 19, This is the age that Alan Cottrell, sculptor, and the Nellie Sheridan Statue Committee have decided appropriate for the full length, life-sized statue his studio will render for the Somerset Square. It will grace the inside southwest corner where Underwood’s Hardware and the Library meet The steps and door located here were the Post Office where Nellie presided for about 48 years. James Young, age 94, visited this Post Office every day, when he was 6 years old, to pick up his Grandfather’s mail, remarks, “She was always glad to see me.” Asked how he knew, he explained, “She always gave me a big smile”, and adds, “She told stories about the Civil War, and waved her hands a lot.” At the first November session, the Somerset Council approved the statue of Nellie Sheridan, and the placement in the SW corner. Council president Dave Snider will be the municipal representative on the statue committee. 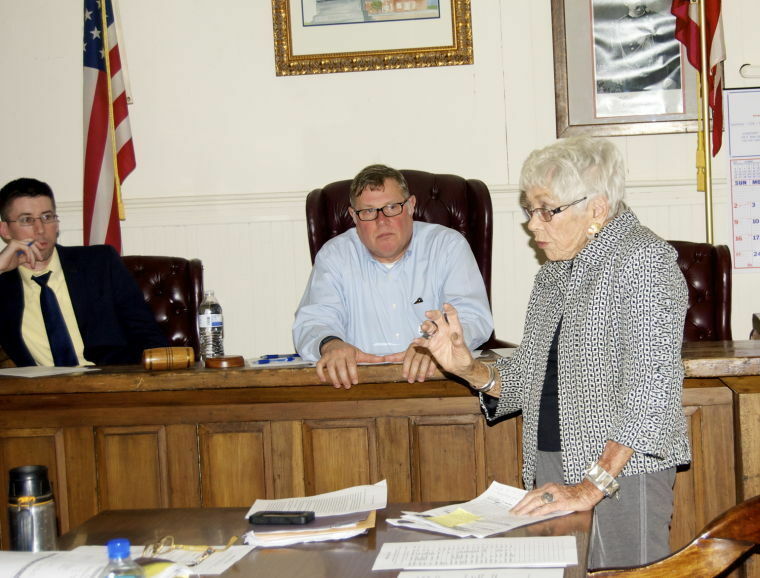 The Perry county Library Board also approved the project at their November meeting.. The committee plans to unveil the statue at some Perry County Bicentennial event in 2017. The cost will be approximately $55000, which will include two maquetts, about 18 inches high, to be used as money-making tools, and later be displayed in the county libraries. Many avenues of fund-raising will be used. At this time a high tea is being planned for Jan. 17, in the American Legion building on Gay Street in Somerset. Cost will be $10 per person At this time, the Nellie Sheridan Statue Committee meets in the Perry Count Library Annex building on west Mail Street in Somerset, on the second Friday of the month. JOIN US!